Pictured above is DeWalt’s DCF895B 1/4″ impact driver. What’s the difference, you ask, between it (the new hotness) and the almost-identical-looking DCF885 that Chuck ran down last week? Well, to start with, it features a brushless motor, which reportedly delivers significantly longer runtime. We don’t yet have one of these in hand, but considering the interest you expressed in the DCF885, we thought we should at least take a look at the technology. 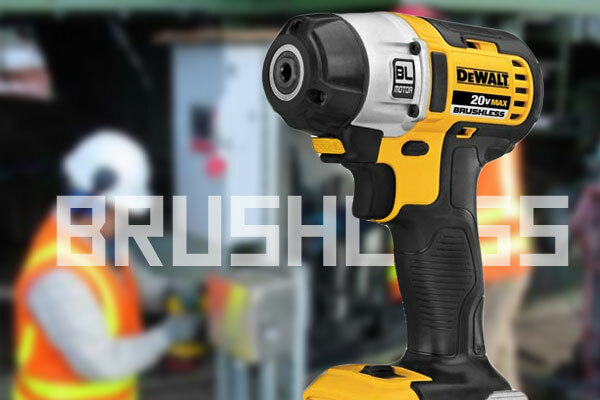 Read on to find out why DeWalt thinks brushless is important and how they’re implementing it in this tool. Let’s start with the motor. We won’t delve into the basics of how motors work, as we suspect this is old news for most Toolmongers. (That said, if you’re not clear on how they work, just Google “how electric motors work” to find lots of great descriptions complete with animations.) But the basic difference between brushed and brushless motors is that in brushed motors you find the motor’s coils on the rotor while in brushless motors the coils are located on the stator. In short: Because all the electromagnets are static, you don’t need some way to transmit power through to the rotating hardware. This offers a number of performance and durability benefits. Ask any remote-control vehicle aficionado why brushless makes sense, and they’ll tell you that brushless motors will generally withstand higher amp loads than brushed motors, which leads to a better power-to-weight ratio — it’s a more efficient design, resulting in less friction and less waste heat. As their impact drivers already deliver plenty of torque, though, DeWalt has chosen to apply that efficiency toward greater runtime. 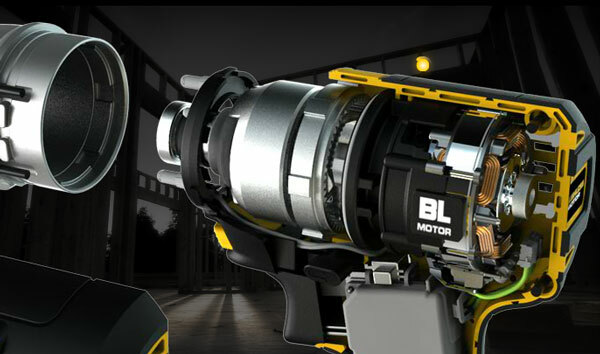 The more efficient motor can deliver similar torque from less juice. Also, brushes are one of the most common points of failure in commercial tool motors. (On most quality brushed-motor tools, manufacturers make it easy to replace the brushes for this reason.) So no brushes means one less (major) point of failure. Along those same lines, heat is one of the ultimate enemies of durability, both in terms of mechanical and electrical components. So less heat equals greater reliability. Though we haven’t had a chance to test it ourselves, DeWalt claims a runtime increase of 57%. To reach those numbers, DeWalt isn’t just relying on the motor. They also added three speed settings — 0-2,850, 0-1,900, and 0-950 RPM delivering up to 3,300, 2,400, and 1,300 impacts/min and max torques of 125, 75, or 42 ft/lbs respectively — which allow you to choose a torque range appropriate to the task at hand rather than just hammering away at max-rated torque. Remember that slower = more torque with electric motors. This makes a lot of sense to us because we can recall many times where we needed to drive a large screw or assemble something with large bolts and we just threw one of the impact drivers in the bag. Seriously, who’s going to carry a small driver, a medium driver, and a large driver? We simply bring a driver big enough to accomplish all the tasks. Of course, if you’re driving full-tilt-boogie all the time, this feature wouldn’t represent much for you in terms of runtime increase. We don’t know how much of the 57% number comes from this feature’s use, so this is definitely on our “to-do” list for when we get one of these in for testing. The rest of the DCF895B’s spec sheet looks a lot like the 885’s: it weighs about the same (2.7 lbs — a little lighter, but not a lot) and it incorporates many of the same physical features Chuck wrote about in terms of the 885 including a 5-1/4″ head length (better to fit in tight spaces), a comfy grip, and annular LED lighting. The 895B also gets an interesting push-button chuck, though, which looks like it might be easier to use one-handed. On the 895B, you push the button under the head to eject the bit, where you pull the collar on the 885. Bottom line: Chuck found the 885 to be a solid tool, at least in his early impressions last week. The 895 offers a number of upgrades, which look pretty interesting. I think it’s easy to look at a comparison like this (885 to 895) and think, “Wow, the 895 completely replaces the 885!” That’s probably true, at least for new, large-scale purchasers. Expect to pay around $250 for the 895 in kit form (tool, charger, battery, and case) and $170 bare tool. (Note that with the 895 introduction you can find 885s now for around $175 in kit form and as low as $80 for the bare tool.) Still, we bet that unless unless runtime is a severe issue for any current 885 users, they’re not likely to put send their 885s to auction in order to swap them out with shiny new 895s. Also, brushless seems to make a lot of sense in the power tool market — which is probably why we’ve received press releases about brushless motor-powered products rom Milwaukee, Hitachi, and Makita, too. As one of those RC guys I can certainly speak to the benefits of brushless. WAY more run time, and that is no BS. A few years back, brushless was a big upgrade in RC cars with an up graded price to boot. Now just about everyone makes them and the price has dropped significantly. Unless you need one right this minute I’d wait. There is no doubt in my mind that within 5-10 years brushless with LiPo or LiIon batteries will become the standard in tools. dewalt are a bit late to the brushless game. Some cordless tools have been running brushless motors since 2004/2005. One example is the festool cordless drills. It’s def not new in the tool industry. If it was me I would buy the Makita or the pannasonic over the Dewalt. It will only be a couple years before the battery’s change again. I agree with Dave. When I was selling tools in a call center around 2005 Festool already had that technology. I think many companies are late to the game simply because they are making to much money on traditionally made tools. Change is slow and always takes time. I for one think that brushless tools area a no brainer.